Cane toads are opportunistic, omnivorous and fearless predators and will eat almost anything they can catch and swallow. Their diet is predominantly comprised of small terrestrial arthropods (such as beetles, spiders, centipedes, millipedes, ants, winged termites and crickets), but also includes larger items such as marine snails, other (smaller) toads, frogs, small snakes, small mammals, small birds, earthworms, planarians, rotting fruit, carrion, household scraps and processed pet food. This search for food often leads cane toads into gardens and places frequented by your pets. Cane toads (Chaunus marinus) synthesise and store a mixture of toxic compounds, collectively known as bufotoxins, as a defensive measure against potential predators. The toxins are stored in glands located on their ‘shoulders’. When a toad is under threat or stress the toxins can be discharged from these glands, commonly as an oozing secretion, and less frequently as a discharge that can be expelled for up to two metres. Any humans and pets which are exposed to the toxins are poisoned. The toxin can cause intense pain and severe irritation to the eyes, and temporary or permanent blindness (NRCMA). It can cause death if left untreated. HOPSTOP spray is a convenient and effective way to control cane toads. When used properly, it’s safe to use around people and pets, and is humane for the toads. As soon as you think a cane toad is on your property secure your pets well out of reach of the toad and reach for a can of HOPSTOP. It’s important to be sure that your target is a cane toad, not a native frog. Native frogs are an important part of our national biodiversity, and are under threat in many ways, including from cane toads. They are also legally protected fauna, and must not be harmed. Cane Toads are usually very large, generally between 9 - 15 cm in length, but they have been known to grow up to 24 cm in length! They are heavily built and the skin on top is rough, dry and covered in warts. The colour can vary from grey, olive, yellow brown to red brown, but they are never brightly coloured. Their underparts are lighter in colour and are usually a mottled brown. Their heads are bony with a pointed snout and over their eyes are distinctive ridges which meet above the nose. Behind and slightly below each eye is a distinctive circular ear drum. On top of each shoulder is a large sack – this is the toxin-producing parotoid gland. Cane toads have slightly webbed, leathery hind feet while the front feet have no webbing and are relatively small in size. Cane toads have a particularly upright stance and they walk or move small distances in short, rapid hops, unlike most native species which leap. 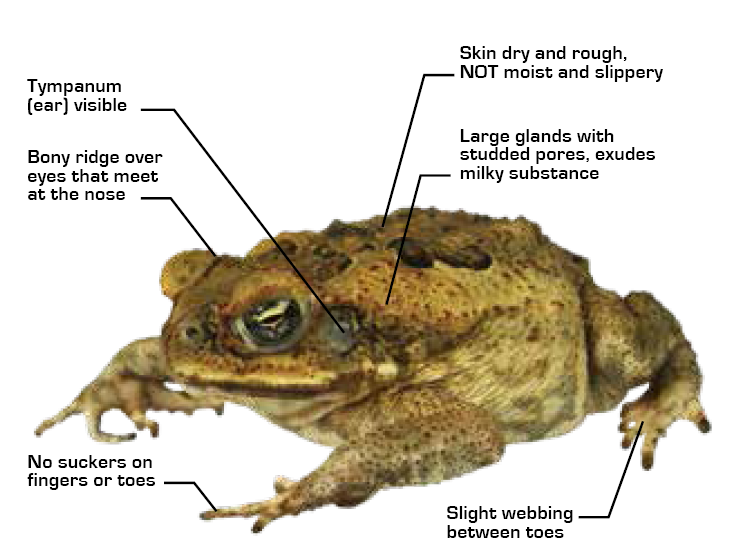 Male toads are smaller and have more warts than females. During the breeding season males will develop ‘nuptial pads’, which look like dark lumps, on their first two fingers. These assist the male with holding onto the female while mating. Adult cane toads are both nocturnal and visual hunters. They need a lot of food to survive so they often congregate in open areas, such as on roads or lawns, where they can spot their next meal. They prefer places that are well lighted, such as below street lamps or around houses, because this is where insects are attracted in the evenings. Cane toads are a terrestrial animal, however they do need daily access to water. This means the toad is most vulnerable during the dry season as they need to stay close to water as the environment begins to dry up.